Dan Larsson, Linkoping, Sweden, studied at the Malmo Academy of Music, and has been solo clarinettist for the Ostgota Wind Orchestra and the Ostgota Wind Quintet for many years. He performs regularly as a chamber soloist, where he likes to perform newly written works. Dan Larsson is also a teacher of clarinet and chamber music at Lunnevad Folk High School. As a student Dan Larsson started to play together with guitarist Magnus Gronlund in Duo Dialog. 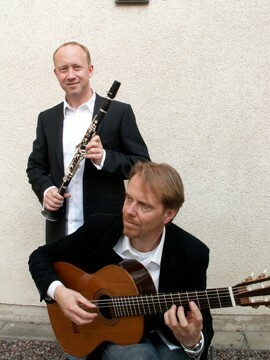 Today, the critically acclaimed duo has performed many well-received concerts at Swedish chamber music festivals and in churches.